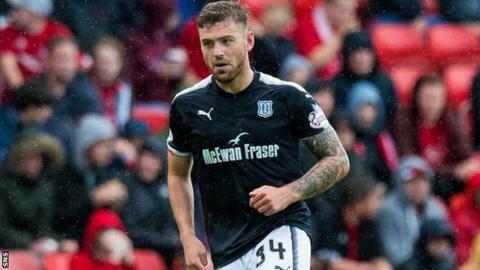 Dundee have signed striker A-Jay Leitch-Smith on loan from Shrewsbury Town until January. The 27-year-old made 21 appearances last season for the English League One side, scoring five times. It comes on the same day 19-year-old defender Kerr Waddell handed the club a boost by signing a new two-year deal. Waddell, 19, was given his first team debut under manager Neil McCann and has already made nine appearances for the Tayside outfit. He has now pledged his future to the club until the summer of 2019. Spanish defender Jon Aurtenetxe will join Waddell in the back four after joining on a short-term deal until January, subject to international clearance. The 25-year-old Spaniard has made more than 100 appearances for La Liga clubs Athletic Bilbao and Celta Vigo and had a loan spell at Tenerife in 2015-16. He impressed Dee manager McCann when on trial at Dens Park last week. Aurtenetxe made his Europa League debut at the age of 17 and played in the 2012 final when Athletic Bilbao lost 3-0 to Atletico Madrid. The club also confirmed the departure of Tom Hateley, who has left the club by mutual consent after making 27 appearances.